In this lesson, we will learn how to read and write whole numbers through millions in three different forms, word, standard, and expanded, and how to convert between them. In which of the following numbers does the digit 8 represent a value of 8 0 0 0 0 0 ? Write seven hundred and ninety-five million, eight hundred and fifty-six thousand, three hundred and ninety-five in digits. Find the equivalent to 650 hundreds. 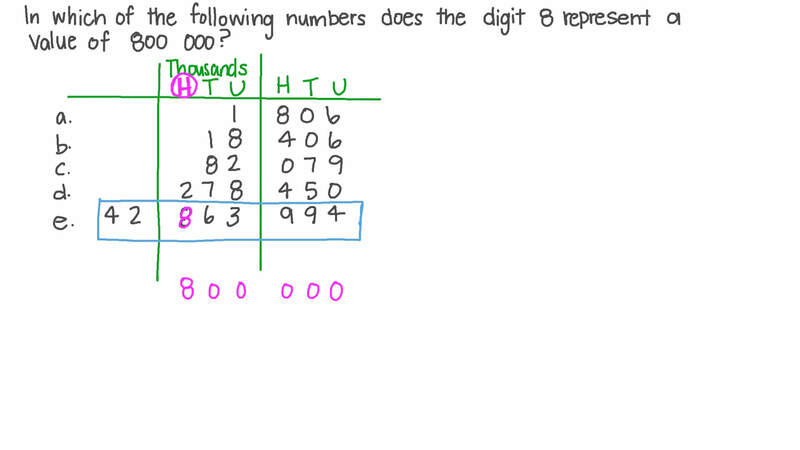 What is the smallest odd 8 -digit number? What value does the 2 represent in the number 1 6 8 5 5 2 6 ? In which of the following numbers does the digit 9 represent a value of 9 0 0 0 0 ? What is the value of the digit 6 in the number 2 4 8 5 6 7 1 ? Write four hundred and seventy-two million, nine hundred and forty-three thousand, eight hundred and thirteen in digits.